ODM January 24, 2018, Day 24 – I SHALL SHINE! I AM A PUZZLE FOR THEM IN 2018! TOPIC – I SHALL SHINE! I AM A PUZZLE FOR THEM IN 2018! TODAY IS DAY 19 OF THIS FASTING PROGRAMME! Turn to page 79 of the “WAR AGAINST HAMAN 13” Booklet and pray Today’s prayers. 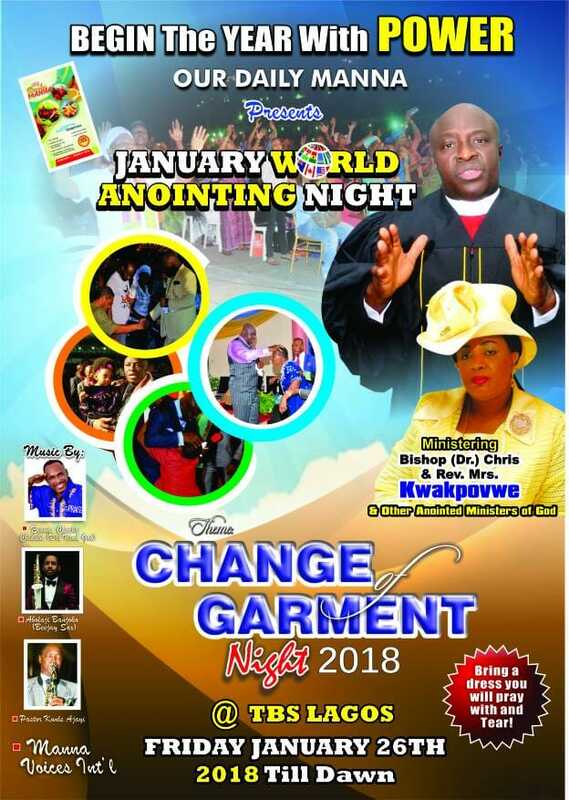 Then be at the TBS Lagos on Friday, January 26th 7 pm for the change of garment world anointing decoration Night! Bring a second dress you can afford to tear after prayers! It will be Great! PRAYER POINTS: Take song1: Draw me nearer….. I must shine! LORD, make me an “equation” that cannot be understood this year in Jesus name. See your WAR AGAINST HAMAN 13 BOOKLET NOW and pray the above prayers! Pray about today seriously and any other issues affecting your peace. Next Post:January 2018 Daily Manna Day 25 – MARRIED AFTER 65 YEARS APART! Will the World Anointing Night be streamed live? If yes where please?